It sometimes happens that there is an element of a band's music that really grates on you. For me it's often the voice of the singer, which explains why I listen to so much instrumental music. In some cases this problem is insurmountable, as is the case for me with Modest Mouse, Antony & the Johnsons, and most music from the 80s. Sometimes, though, I can get over it and love it anyway, like with the Wrens (emo voice, gag me) and the Pillows (in Japanese, which is incredibly distracting). 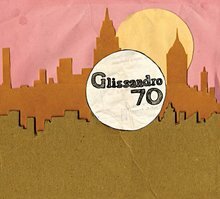 Glissandro 70 manages to overcome its weak link, which happens to be an aggravating vocalist, never content to let the music speak for itself. It's comparable to !! !, but instead of mumbling cliches, this guy or guys feel the need to voice the rhythm of the song, and usually it doesn't work out well. If you have to make your voice comprise the body of the song, make it good, like Spiritualized's "Ladies and Gentlemen We Are Floating In Space." Because otherwise people are going to laugh. Aside from this crippling deformity, Glissandro 70's music is pretty good. It's a first release and it's on Constellation, so you can't expect too much polish, but you can expect some originality and earnest experimentation. The first track is a Volta Do Mar-esque, mathy and slightly discordant guitar theme that builds on itself and breaks into a nice little funky tune that is interesting if not catchy. The next track is pretty much a skipper, take my advice and don't bother with it. "Bolan Muppets" sounds shorter than it is, possibly because it's a really great song. It has an insistent little rhythm guitar that gets built on for a while, and if you ignore the "EEEEYAAHHHHH....YOOOOLAAA" that starts in around the 2-minute mark you can sort of mentally transport yourself to the third and best part of the song. Here someone sings sweet nonsense, and does it well - although I don't know the words and I'm sure they're insane, I find myself humming it constantly. It has the kind of natural beat and rhythmic sound of a good poetic line, and it's a bit hypnotizing. "Portugal Rua Rua," similarly, contains a bothersome and insistent vocal part, and although you tune it out after a bit, it would be better had it never existed at all. The track improves, anyway, and becomes hypnotic and enjoyable once again. The final track is more ambient, and while it contains most of the same components of the other tracks, it feels thinner and more spread out - less a song and more a 13-minute weirdo improvisation. I can't in good conscience recommend this to everybody, but if you consider yourself a tolerant listener, this is a rewarding EP. I think it has an original sound, which is great to hear these days, though I'd consider this EP more of an indication of good things to come than an accomplishment in itself. Also consider that you're really only getting three solid tracks (out of only five, but still), so if you can find it used or in a bargain bin, that's your best bet. In any case, check out this song and you'll get a better idea of the music than I can give you with my feeble descriptions. Here's "Bolan Muppets," by Glissandro 70.
later: What the hell, 15 megabytes for a 7 minute song? Time to check some settings. this is probably the worst and most ignorant review i have ever had to read. who lets this guy write online reviews anyway? how much more chlichee can you get? The first track is a Volta Do Mar-esque, mathy and slightly discordant guitar theme that builds on itself and breaks into a nice little funky tune that is interesting if not catchy.